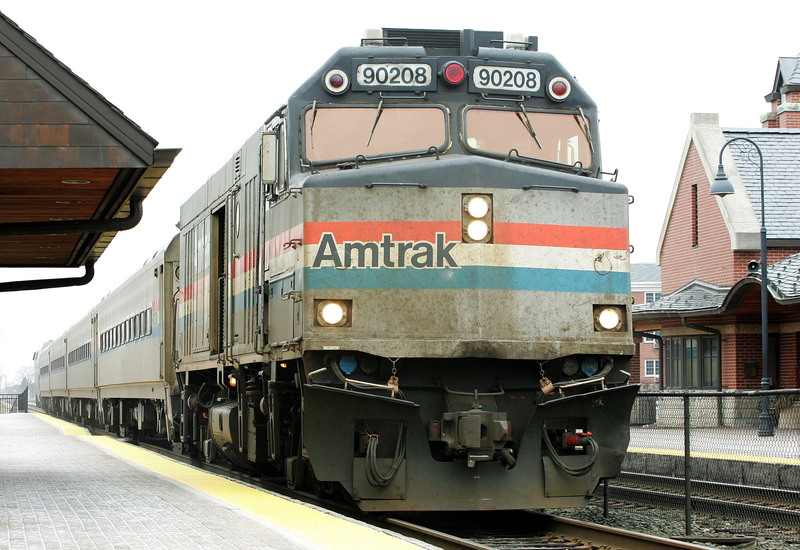 amtrak | Apple pie, anyone? It has come to my attention that I sent Rylie to Camp Sebeck in Texas for the month of June with lots and lots of undies but no pyjamas. And so my bid for Mother of the Year continues. After waiting for news of our train to St. Louis for 5 hours, we finally got up to board and you- of all the 800 other passengers- were standing behind us. After I got all our schtuff situated in line, I turned around to situate Rylie and found her standing quietly holding your hand. Seven hours later, Rylie was asking for your address and giving you a hug… and we were both so sad to leave you. Please move to Michigan, or at least- come visit soon. We love you very much. Very, very much. Congratulations on making it through your boys’ weekend, though it doesn’t appear that any of you remember much of it. You were all very Chicago-Metro-Chic and handsome, though I believe I arrived half-drunk myself from the alcohol oozing from your pores. Thanks for the throwback to college frat days and weekends with good friends. I hope you all made it home ok. I apologize for knowing so much about your personal life, but the volume of your cell phone conversation made every person in our train-car emotionally invested in your journey to Grand Rapids to spend some time with your F*#)ing Amazing New Boyfriend. If I may offer a word of advice: please don’t use any more of your credit cards to buy seventeen-hundred dollars worth of ‘special bedroom’ toys. If he’s as awesome as he sounds (and we all heard him), you’ll be just fine. Mister Conductor on the Pere Marquette, your train is new and clean and awesome. Thank you for the high-fives every time you passed and the complimentary wake-up call at the Next Stop Grand Rapids. I quite literally wouldn’t have made it home without you. Your cafe cart on the Pere Marquette knows no equal. Rylie is still talking about the man who sells giant m&ms and can whistle like a canary. You have a gift, my friend. Thank you for sharing it with us. I’ll buy a six-dollar sandwich from you any time. Car #3 could barely contain your joy as you returned from a revival on Spiritual Victory in Texas. God bless you. Your three-piece suits, worn leather Bibles, perfectly placed hair, and glory hymns on the way home were like being transported back to the deep South of the 1960s in the best possible way. Thank you for reminding me that it is still possible to travel in style. God is amazingly diverse in His creation. Who would you have most liked to sit by? Giddyup! That makes Jim (with a guess of $103.75) our winner. Correct me if I’m wrong. Jim, you win a Pere Marquette magnet for your fridge… the train that goes from Grand Rapids to Chicago. I liked it so much, I bought one for myself. AND, one for Amy… the angel of a friend who met me in Union Station after a 2-hour delayed arrival and took my child with her three in-tow for a walk while I waited in line for over an hour to fix our connecting St. Louis tickets. Amy also brought me a coke and a sandwich, a lunchable with a caprisun for Rylie, and a brown bag of surprises for the rest of our trip. She sat on the floor with me in the waiting lounge while our children wrestled and let the industrial fan blow up their shirts like superheros. If she weren’t already taken, I’d have asked her to marry me. If you ever find yourself pregnant and stuck in a train station within 50 miles of Amy, I highly recommend her. The trip was really, really decent. It was. Ry was beyond thrilled with the train. We could walk at will, plug in her dvd player, grab a snack in the lounge… so incredibly lovely. Even with Friday’s insanity (We didn’t end up leaving Chicago until 6pm, and arriving in St. Louis at midnight as opposed to 7pm. ), it was still better than a plane trip with kids. Hands down. I’d do it again in a heartbeat. I will confess that I had some considerable trouble walking out of the house without Rylie Sunday morning. It has nothing to do with my parents, or even the length of stay. It was simply the fact that Rylie is old enough now to realize I was leaving without her… and asked me to stay. It never crossed my mind that she would put that all together, but that’s me assuming her lack of voice means a lack of understanding. I warn everyone about that… but forgot it myself. Our lives are so intertwined… I am a mom, a therapist, an interpreter, a motivator, a bodyguard- so many things for my little girl! It’s only been 2 days and already I am shocked at the amount of emotional and physical energy I am NOT using. Shocked at how much less I use my voice. Shocked at how calm everything is around here. May this coming month be a rest for both of us. Thursday, I’d like to tell you about some of the characters we met on our journey.